Seasonal changes take their toll on everyone, but for professionals who rely on their voice performance, the problem needed to be addressed. Season37 by Clyor was designed to combat the coldest of winters! As performers ourselves, we understand the need to avoid and prevent seasonal strains on the voice at all costs, and we are proud to say that we use Season37 ourselves. The results are incredible! Avoid croaky and hoarse voice brought about by the seasonal common cold with Season37. We understand the challenges vocal performers face while singing or speaking. Only the purest of nature will sooth your symptoms, and keep your voice intact. 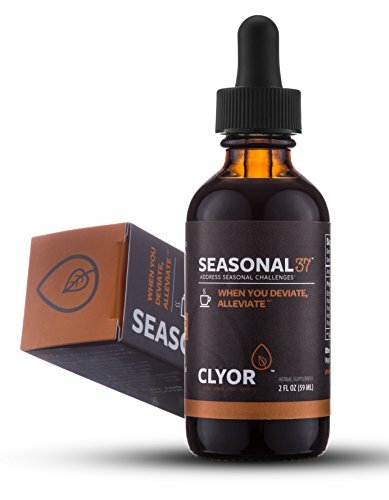 Season37 helps relieve the symptoms of the common cold, and has been known to be effective against seasonal allergies. How does it work? Seasonal37 quickly heals colds and soothes your throat membranes & larynx, to allow for talking, singing and performing through any season, at your full potential. There is nothing like a bad cold, or cough to drive you searching for immune system boosters or natural healing. With Clyor you can strengthen the body & relieve symptoms. All natural ingredients are combined by design of professional vocalists with top herbalists, especially for voice care. Note that if negative symptoms persist you should contact your doctor, especially if nursing or pregnant. NEW BRAND PROVEN QUALITY: Formerly Sprouts, Clyor's remedies have a long track record of success and effectiveness. These supplements are created in partnership with professions vocalists and singers. NATURE IN A BOTTLE: This common cold remedy is alcohol free. It is vegetarian based, including Echinacea Herb, Red Root, Green Tea, Elderberry, Thyme, Red Clover, Ginger & more. Enjoy nature's healthiest and best. If you have any questions about this product by CLYOR, contact us by completing and submitting the form below. If you are looking for a specif part number, please include it with your message.